This tapestry was inspired by wall paper by William Shand-Kydd. The stylised peacock is on a background of flowers, butterflies and bees - there are even ladybirds and caterpillars hidden in the foiliage. 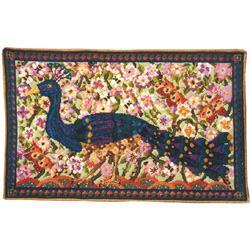 The kit uses Anchor tapestry wool on 10hpi canvas and measures 26" x 16" (67 x 42cm) suitable for a wallhanging.